Enjoy great hair with these styling tips! Michelle Martin is a former Sales Educator at Redken. She now does cuts and color at Hair to Dye For in Virginia Beach, Virginia. We chatted about hair care, common styling problems, and how products work with the chemical makeup of hair. LoveToKnow (LTK): With summer coming, frizzy hair is going to be a big problem for a lot of us. What's the best way to control the frizzies? Michelle Martin (MM): There is no way to completely control frizzy hair. Hair is going to frizz because of humidity more than anything. There are things that will help, though. Anything that's a little heavy or oily or greasy-it has to have a water barrier. For example, I like a product called Silk, made by CHI. You can work it in when hair is wet or dry. Redken makes a product called Align, which is actually a straightener, but if you let your hair air dry it will help control curls. It smells great. I remember I had some on my hands one day when I left the salon, and someone actually stopped me to ask what smelled so good! LTK: What about people who want to straighten out their curls or waves? MM: CHI has a chemical straightening system that is awesome, whether hair is curly or frizzy. It's what people used to call Japanese hair straightening. It actually breaks down chemical bonds in the hair. Different amino acids make up the protein chains in your hair, and sulfur bonds in the chains are what make the hair curly or straight. First thing you have to do is go in and break those bonds loose. Then you have to pull it straight. Then you add a neutralizer to harden the bonds back up again, and hair stays straight. It's extremely expensive, though, and the process is tedious and long. It costs about $500. You have to shampoo the hair, treat it, blow it dry, use a straightening iron, then use the chemical product, then shampoo and treat again, then blow dry, iron again, and neutralize the process with another chemical. But when it's done, with all those treatments, you don't even feel like you have chemical in your hair. If you remember in the old days, when you got a perm, hair had a special feel to it. You could tell it was a perm. Other straightening systems work, but they don't leave hair feeling so great. LTK: Sometimes you just want to straighten your hair for an evening out, or get a new look for a day or two. Are there special techniques for that? MM: Shampoo, then blow dry with a straightening product like Align. Get the hair 50 to 75% dry, and then begin using a big round brush to straighten out the curl while continuing to blow dry. If you start using the brush right away you'll be there forever. When hair is dry, mist on a spray shine product. Then smooth the hair out with a flat iron, and you're good to go. LTK: I've heard that using an iron on damp hair can cause singeing. Is that true? MM: I don't know about singeing, but using the iron on damp hair won't work. Your goal is to break down the hydrogen bonds in the hair that contribute to the curl. The hair needs to be dry in order to do that, or else the curl will pop right back in. LTK: Let's talk about the opposite issue. How do you enhance curls and waves? MM: The best ways are by letting the hair dry naturally, using a diffuser on a hair dryer, or scrunching it while directing the nozzle of the dryer toward the scalp. When the hair is wet, the hydrogen bonds are broken down and you can comb through it and pull it straight and it's really long. If you let it air dry, the weight of the water in the hair is going to give it a looser curl. 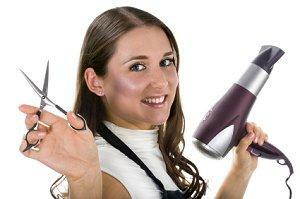 Blowing a lot of air around with a hair dryer will really enhance frizz. If you want more curl, try a diffuser. What a diffuser does is go in and, without disturbing the hair, lets it curl up more without the water pulling it down. You can also try a director. A director concentrates the air into a smaller area. If you have a director on your drier so the air isn't going everywhere, you can work that air in to the scalp area. That will get the water out and push more curl into the hair without blowing it everywhere. Scrunching while using the director helps enhance the curl. LTK: Can you suggest any products for curly hair? MM: Start with a leave-in moisturizing conditioner, something that's going to keep water in the hair. You can layer products, beginning with the leave-in conditioner. One thing to try is mixing products, which is called "cocktailing." A mousse is really fast drying, so it's great for a lot of curl. But a lot of mousses leave the hair dry and crunchy feeling. So you can mix a mousse with an oily product like the Silk, and that will combat that feeling. It will also enhance the shine, because curly hair has a tendency to look a little dull. The outside of hair is sort of like a fish scale; in curly hair that gets raised up and the light doesn't reflect off it well. Products smooth down the cuticle so light reflects better, which makes hair look shinier. LTK: How can you add body to thin or flat hair? MM: The biggest problem with flat hair is that even if the hair is fine, there's too much weight, which is what causes it to lay flat. In order to eliminate that problem, have the stylist lightly texturize your hair. Texturizing can be done with thinning shears, or by surface cutting, notching-the idea is to go into the body of the hair, closer into the scalp, and removing selected pieces of hair. The shorter pieces will support the other hair and hold it up. Adding layers can help, too. Work a product, like a styling lotion-Redken's Contour is good-into just the scalp area and blow dry at the scalp. Later you can add product into the ends, but if you want lift, you need to dry the scalp area first. The idea is to direct the stem area, where the hair grows out of the scalp, off the head. Once you have your volume, you can do anything you want with the ends. LTK: I've always wondered about drugstore shampoos versus salon products. Is it really worth it to spend so much more for salon products? MM: Yes! It all comes down to pH. The natural pH level of the oil in the hair and skin is 5.5 to 4.5. It's acidic. In order for drugstore shampoos to be cost effective, they're more alkali. They clean the hair very well, but they strip the natural oils. Ends will be dry and the scalp will be oily because when the product strips the natural pH oils, the body actually increases production. I see it a lot: ends are really dry and scalp hair is really oily. Most salon products are in an acidic pH range. That also protects against color fading, by slowing down dye escaping from hair. It's also worth spending the money not just for pH but for the water content. Salon shampoos tend to be more concentrated, so you don't need to use that much. A 10 ounce bottle should last at least a month. LTK: Anything else I should know about shampoo? MM: A lot of people like high lather shampoos, because if there's no lather they think it's not working. The way shampoo works is that its molecules have a head and a tail, and the head likes dirt and the tail likes water. The head grabs the dirt and the tail pulls it out. How dirty the hair is makes a difference: you'll get more lather if your hair is clean. Or, more lather may just mean more detergent. The way to tell if your shampoo is working is if your hair feels clean after you use it. Wet hair is clean when it starts to squeak. Many products are loaded with moisturizer, and people think-this is the biggest misconception-that more is better. But hair can have too much moisture. It's stretchy and it looks dry and it won't hold a curl. It's hard to recognize because it looks dry, but it's not! People who live in dry areas, like out in Arizona, will probably do ok with moisturizing shampoos because there isn't much moisture in the air. Here in the Tidewater area of Virginia, where humidity is high, you don't need to add moisturizer because then the hair goes flat. By the way, naturally flat hair needs a protein shampoo, and you're not going to find that in the drugstore. Protein strengthens the hair. The finer the hair, the less protein it has. Finer hair doesn't hold curl well; use a curling iron and the curls might only last a few hours. It happens because hair absorbs moisture from the air, and that makes the curls fall out. Redken makes a protein spray called CAT that really helps keep fine hair from going flat. On the other hand, naturally coarse hair does benefit from moisturizer. It doesn't need the extra protein, because the thicker hair strands actually contain more protein chains. LTK: What about preserving color? Do color-extending products work? MM: One thing just about color: the color that fades the fastest is red. The molecules for red dye are very large, and it's hard to get them into the hair shaft. A lot of times the red dyes are direct, which means they lie along the hair shaft and some get lodged under the cuticle. When you start shampooing, they come right off! Another thing is salt. People go to the gym every day, and they sweat. The salt attaches to the dye molecules and pulls them out. Color-extending products do help. Redken's Color Extend is especially good for coarser hair. LTK: What about swimmers? Is there any way to prevent chlorine damage or get chlorine out of hair? MM: Chlorine enters into the hair and bonds to its protein chains. It goes in there, and if there's already any damage to the hair, chlorine's going to go in there and lodge. There's a salon treatment called Pre-Art from Redken-its molecules attach to any kind of molecules-medicine, chlorine, and so on in the hair. When you take the product off the hair it pulls all that garbage out. Most people just need one treatment, but it can take two or three, like if someone comes in with green hair. Something you can use at home on a regular basis is Hair Cleansing Cream. It doesn't strip the hair, it doesn't raise the alkalinity, but it goes in and attaches to the chemicals and pulls them out. It used to be that these sorts of products in the salon were alkali, and they would swell the hair and basically strip it. Look for a product that doesn't do that, because that's going to make your hair feel worse. LTK: Thank you for taking the time to share your advice! MM: It's my pleasure. I really enjoy learning about the scientific aspects of hair care. And it's fun to share that information with others.